This stand-alone mountain home features a second story deck with a private hot tub and beautiful mountain views. Vaulted ceilings, upgraded kitchen and private laundry. Short walk to shuttle. This stand-alone home is 1,920 square feet and has 3 bedrooms and 3 bathrooms and sleeps 8. It features vaulted ceilings and a second story deck with a private hot tub and beautiful mountain views. The kitchen has granite countertops and stainless steel appliances. The basement den has a walk-out patio with access to greenspace. There is private laundry and a private garage. With beautiful decor and wood throughout, you have the feel of a mountain home. Head upstairs to the main entryway with a closet and a bench for your convenience while coming and going throughout the day. The living room features a large fireplace with stone surround and a flat screen TV. Large windows allow for natural light to stream in and the french doors lead out to the private deck. On the deck you're treated to a private hot tub and panoramic mountain views. There is also seating and a private grill. The full-sized kitchen is stocked with cookware and tableware to make a meal away from home and features granite countertops and stainless steel appliances. The dining area seats six and there is a dry bar nearby. The main floor guest bathroom is just off the living area. All bathrooms are stocked with towels and an initial supply of toiletries. The private laundry room is also on the main floor. It features a new full-sized washer and dryer. For your convenience, laundry soap is provided. The spacious master bedroom is upstairs in the loft. It features a king-sized bed, a flat screen TV and a seating area. The vaulted ceilings offer an open feel and an additional window for natural light. The en suite bathroom has a walk-in shower with tile surround and a soaking tub. Downstairs on the lower level are two guest bedrooms. The first guest bedroom features a queen-sized bed and a flat screen TV. The second guest bedroom can also serve as a den. It has a bunk bed and a sectional with a queen-sized sleeper sofa. Additional sheets and blankets are in a closet. There is also a flat screen TV and a walk-out patio with access to greenspace. The guest bathroom on this level has a single sink vanity and a shower/tub combination. Easy booking, check-in, check-out. Large clean space, nice deck with hot tub. Very comfortable, will be back. Everything was wonderful. Pretty, comfy home. Great hot tub. Short drive to Keystone Resort. If I could suggest anything, it would be more family room seating, maybe a coffee table. Overall good experience. Hot Tub needed some attention. Perhaps cleaning it. The house was nice other than the hot tub was turned down to 64 degrees and it took 12hours to get it to temp and there wasn't enough trash bags. I would stay there again. The cabin was as advertised. Very close to the slopes with a great view from the hot tub. Would highly recommend. The pullout couch was the only thing that could have been a little better. We stayed at 67 Hanson Rd. over winter break. The property had a fantastic view of Keystone Resort, day and night. The house was nice and clean, but the furniture could use updating and the mattresses were really sagging. A foam topper had been added to the beds, but this did little to alleviate the large pit in the middle of each half of the beds. On the upside, the hot tub was fantastic and we got to watch the fireworks on New Year's Eve from the tub. A few light bulbs were burnt out (including a few key bulbs over the stove) so we asked the management co. to replace them, but they never followed through. Considering the fact that we were there for 6 days, this was disappointing. Excellent family oriented place in the heart of Keystone! Warm and cozy just like it was described. Would love to stay there again. The house is not overly spacious (the photos make it look larger than it is) but it was the perfect size for 4 guests! We had plenty of room to relax and enjoy ourselves. Everything was very clean! The ski base was also a very convenient walking distance. Would definitely stay there again. House was great but we were really looking forward to using the hot tub. The hot tub was cold when we arrived and did not heat up before we had to leave. We had an amazing vacation, staying here was perfect for us. 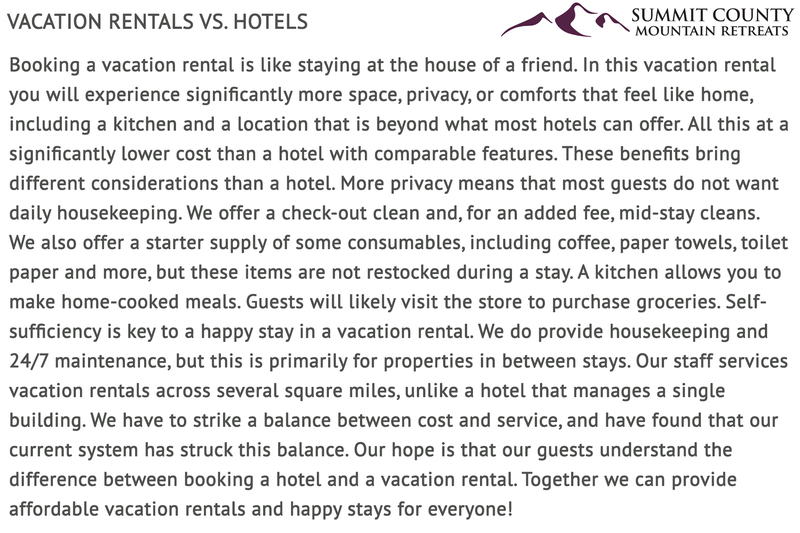 It is located in a great location only minutes from keystone resort. We would definitely use this location again! One of the most beautiful views I’ve ever seen! The house was perfect for 4 people and very spacious. Overall we were completely satisfied with our stay, the cabin was beautiful and in a beautiful spot, however, the mid floor bathroom sink would drain very slowly and was impossible to keep clean. We were close to a lot of other towns near by for other scenic and tourist spots. Our stay was completely peaceful and will be returning with our children either this spring or next fall. Review by RAJA BHARATH V.
We stayed two nights for a quick weekend getaway and were not disappointed with this lovely home. Everything was as described and in good condition. The kitchen was well supplied, we had plenty of linens and the hot tub was a great way to enjoy the evenings. Such a great place for my friends and I to reconnect and relax! The hot tub was awesome on the deck. Love this house! I cannot wait for next year when we can come back. We had one very small issue with the disposal but it was rectified before we were back from a hike. Thank you so much! Beautiful house with a few draw backs. The house it self was beautiful and very clean. My wife and I rented this for our 11 year anniversary and were a bit disappointed. The neighbors are very close you can hear them talking when you are in the house. The hot tub was the main reason we chose this place however there was a gross brown film on the top of the hot tub and the water was very dirty. The front door didn't lock which was a little dis-concerning and lastly the shower door feel off when I was getting out of the shower, I am glad that it didn't break as it was a glass door. The view was great and it is very easy to get into town just not the mountain solution I was expecting. We are sorry it is not clear how the front door operates. It does work properly. We will try to explain this better to future guests. We are also sorry that the hot tub water had a film on it. It was serviced and inspected the day prior to this guest's arrival. We are not sure why there was an issue. Unfortunately, this issue was not reported to us during the guest's stay. We also were not informed of the issue with the shower door, but we have since inspected it and it is working normally. The quality of the house was good. Summit County mgmt was good. We were centrally located for what we wanted to do, boating, golfing, and just enjoy the outdoors. Colorado in the summer is heaven on earth. We would stay here again. The entire stay was perfect. The house itself had all the basics plus some extras that made the stay with our small group of friends and significant others amazing. 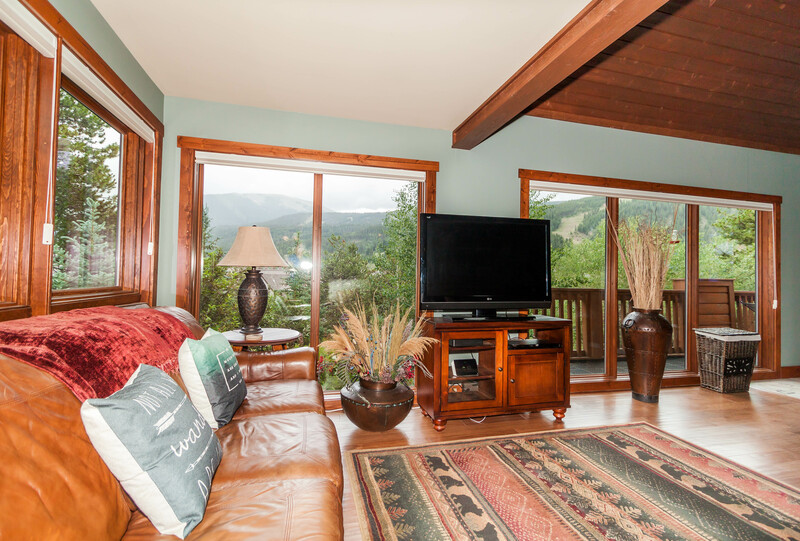 The view out of the living room and from the deck where the hot tub sits is BEAUTIFUL at night and during the day as you are looking directly at Keystone slopes. The only draw back was the propane tank for the grill didn't work but we cooked our burgers on the stove. Would absolutely go back. Cheers!